The 3.1M ft2 structure located at 111 8th Avenue occupies an entire city block and is presently one of the largest technology-owned office spaces in the world. The company has a multi-phase, 10-year plan to occupy the complete building. Currently, the 11th floor is being renovated in two phases, each approximately 88,000 square feet. The floor plan is 200′ wide with 14′ high windows. The finished ceilings will be 14.5′ high in open areas and 9′ high in enclosed areas. The resulting spaces will include a cafeteria, auditorium and open office space. Prior to initiating demolition, Benchmark Builders (the General Contractor) was asked to visit another construction project in NYC and investigate a low-voltage LED construction site lighting system deployed there; the FLEX SLS by Clear-Vu Lighting. The team members that visited the installation were impressed by the quality lighting and energy efficiency of the FLEX System compared to traditional bulbs and learned about significantly reduced maintenance labor resulting from the robust design and construction of the LED “modules”. The upfront cost of the technology and resistance to change were the biggest hurdles in moving forward with the FLEX System. Traditional temporary lighting for this type of project typically comprises line voltage “stringers” with either incandescent or CFL bulbs spaced every 10′ in flimsy plastic cages. This method of lighting is generally considered “Means and Methods” and is rarely specified at the architect, engineer, or GC level. Rather, the CM or GC mandates that the Electrical Contractor must provide OSHA minimum light levels (5 foot candles), and comply with the National Electric Code (NEC). This inevitably leads down the path of the electrical contractor factoring its bid based on the lowest initial-cost materials, which tend to consume the highest amount of electricity and provide the least amount of light. For example, a 100W incandescent light bulb spaced on 10′ centers consumes approximately 1 watt per ft2, and does not even reach the OSHA minimum requirements. This is followed by a constant back-and-forth argument with the GC to increase light levels where work is taking place and move lights around as the job progresses. While these “stringers” are cheap to purchase, they are unsafe and more expensive to maintain over longer term projects. Such stringers operate at high voltage, exposing workers to electrical shock hazards. Incandescent bulbs cause burns and start fires, and CFL bulbs contain mercury that vaporizes into the air on a site when bulbs are routinely broken. Both types of bulbs need to be replaced many times over the course of a year, and the stringers are disposed of at the end of the project. In addition, traditional temporary lighting in NYC is generally left on 24 hours at full power to provide emergency egress and security. This results in a waste of electricity where a lower light level would be acceptable (1 foot candle), and light pollution to surrounding neighborhoods during evening hours. The FLEX System required a new business model to disrupt the habitual bad practices of the industry. Benchmark considered FLEX a good investment in terms of energy savings, safety improvement, and sustainability. This led to the specification of the system to the electrical contractor, and the upfront cost was determined to be offset by the electricity savings and reduction in maintenance labor and replacement materials. In terms of energy and cost savings, the typical 1W/ft2 of traditional lighting was reduced by approximately 95%. The robust design of the modules lead to a operating life of approximately 6–8 years – which will cover the two phases of this project entirely along with the next several projects in the 10-year plan, without requiring substantial replacement materials and/or maintenance labor. Advanced planning minimized installation and reconfiguration tasks by arranging a grid based on finished wall and corridor design. The LED modules were spaced 12′ apart (reducing total fixture count versus traditional bulbs at 10′ spacing) while still exceeding the OSHA required light levels. In addition, Benchmark coordinated connecting into the main bus line and adding LED modules as needed for new work areas or increasing light levels in existing space. With respect to safety, the jobsite attained higher light levels with great uniformity and minimal glare than typical on a project. Since FLEX is a low voltage system it has minimized worker exposure to electrocution hazard (UL does not consider lighting systems operating under 30 volts to pose a risk of shock). This is in contrast to traditional temporary lighting, which operates at high voltage. (Electric shock was the #3 cause of construction site injuries and fatalities in 2012.) The FLEX System also contains no glass or hazardous materials such as mercury, and never gets too hot to touch, let alone start a fire. The 12-month Phase 1 energy savings are projected at $151,886 based on New York City’s current electricity rates, with an ROI in less than 4 months. Counting both phases of this project, the net savings are expected to reach at least $252,567. 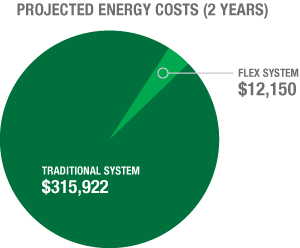 The FLEX SLS System will save upwards of $1.5 Million over its lifetime. Light pollution has been minimized and additional energy savings over the standard system were a result of the FPS450DT power supply which reduced system power by an additional 75% during night and weekends.